For the treatment and control of gastro-intestinal nematodes, lungworms, eyeworms, warbles, chorioptic and sarcoptic mange and sucking and biting lice of beef and non-lactating dairy cattle. POM-VPS. Strongyloides papillosus (adult) and Trichuris spp (adult). Lunworms: Noromectin 0.5% w/v Pour-On Solution kills lungworms (adult and fourth stage larvae): Dictyocaulus viviparus. Eyeworms: Noromectin 0.5% w/v Pour-On Solution kills eyeworms (adults): Thelazia spp. Warbles: Noromectin 0.5% w/v Pour-On Solution kills warbles (parasitic stages): Hypoderma bovis and Hypoderma lineatum. Mange Mites: Noromectin 0.5% w/v Pour-On Solution kills mange mites: Sarcoptes scabiei var bovis and Chorioptes bovis. Lice: Noromectin 0.5% w/v Pour-On Solution kills lice: Linognathus vituli, Haematopinus eurysternus, Damalinia bovis and Solenopotes capillatus. Noromectin 0.5% w/v Pour-On Solution given at the recommended dosage of 500 micrograms ivermectin/ kg bodyweight controls infections with: Trichostrongylus axei and Cooperia spp acquired up to 14 days after treatment; Ostertagia ostertagi andOesophagostomum radiatumacquired up to 21 days after treatment and Dictyocaulus viviparus acquired up to 28 days after treatment. It also controls horn flies (Haematobia irritans) for up to 35 days after treatment. To obtain optimal benefit from the persistent activity of Noromectin Pour-On, it is recommended that calves which are set-stocked in their first grazing season should be treated 3, 8 and 13 weeks after the day of turn-out. Studies have demonstrated that first season grazing calves turned out to pasture in late April or May and treated with Noromectin Pour-On 3, 8 and 13 weeks after turnout can be protected from parasitic gastroenteritis and lungworm disease throughout the grazing season, provided they are set-stocked, all the calves should be included in the programme and that no untreated cattle are added to the pasture. Rainfall before or after treatment will not affect the efficacy of Noromectin Pour-On. Administration: The formulation should be applied along the mid-line of the back in a narrow strip between the withers and tailhead. This product has been formulated only for external application to cattle, do not use in other species. To ensure administration of a correct dose, bodyweight should be determined as accurately as possible; accuracy of the dosing device should be checked. Animals must not be slaughtered for human consumption during treatment. Cattle may be slaughtered for human consumption only after 28 days from the last treatment. Do not use in cows producing milk for human consumption. Do not use in non-lactating dairy cows, including pregnant heifers, within 60 days of calving. HIGHLY FLAMMABLE - KEEP AWAY FROM HEAT, SPARKS, OPEN FLAME OR OTHER SOURCES OF IGNITION. Do not apply to areas of skin which may have mange, scabs or other lesions or to areas contaminated with mud or manure. Noromectin Pour-On has been formulated for topical application specifically in cattle. It should not be applied or administered to other species as severe adverse reactions, including fatalities in dogs, may occur. Noromectin Pour-On may be irritating to human skin and eyes and the user should be careful not to apply it to himself or other persons. Operators should wear nitrile rubber gloves, rubber boots and a waterproof coat when applying the product. Protective clothing should be washed after use. If accidental skin contact occurs, wash the affected area immediately with soap and water. If accidental eye exposure occurs, flush the eyes immediately with water and get medical attention. Do not smoke or eat while handling the product. Wash hands after use. Use only in well ventilated areas or outdoors. Resistance to ivermectin (an avermectin) has been reported in Cooperia oncophora in cattle within the EU, in Teladorsagia in cattle in developed countries such as New Zealand and Haemonchus in cattle outside the EU. Therefore the use of this product should be based on local (regional, farm) epidemiological information about susceptibility of nematodes and recommendations on how to limit further selection for resistance to anthelmintics. Do not contaminate surface waters or ditches with product or used containers. Drug containers and any residual contents should be disposed of safely, e.g. by burying in waste ground away from water courses. The containers should be stored upright in their original boxes when not in use. If stored at temperatures below 0°C, Noromectin Pour-On may appear cloudy. Allowing to warm at room temperature will restore the normal appearance without affecting efficacy. 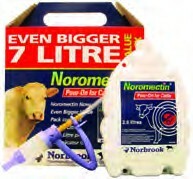 There are currently no questions for Norbrook Noromectin 0.5% Pour On Solution - be the first to ask one!